New York, USA [A. McChesney, CD EUDNews]. April 7, 2015. Pictures: 1. 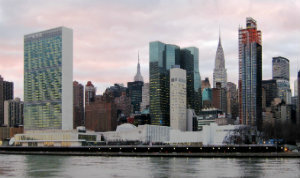 Headquarters of the UN in New York City. 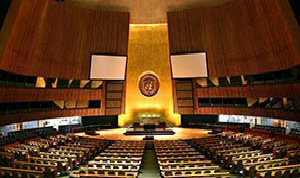 2.UN General Assembly hall. 3. John Graz with Ganoune Diop . By: A. McChesney, CD EUDNews.